This is the first experimentation I have done in quite a while. I used a Magic Pencil (available at many art stores and at Amazon), which changes color as you draw. I’ve done a few of these in the past on white tiles, but this is the first time I tried it on a black tile. For the shading/highlighting, I used General’s Charcoal White, a sort of white pastel type pencil that is the “official” whit shading pencil of the Zentangle community. Despite its versatility when used with other media, I found it difficult to use as effectively as I would have liked with the very waxy Magic Pencil. As I said, an experiment. For two reasons 1) to test hoe the two pencils interact; and 2) to ease my way into using black tiles again. Black tiles are great until you draw your first white Gelly Roll pen on it. We are used to seeing black ink on white paper, but less often see white pen on a black surface. Thus, originally, it took me many months to feel brave enough to tangle on black tiles. So I deliberately purchased a big box of the tiles. The moment I had lots of them, my fear disappeared, and I was drawing all sorts of beautiful designs while experimenting with several brands of white gel pen. The moment I found my perfect combination (a fine-line Angelic gel pen), I took to black tiles like s fish to water. After Hurricane Irma, when I had fewer supplies than I was used to (I thought all were lost during Irma, but was flooded with donations from the Zentangle community), my fear of tangling on black tiles returned in proportion to the decrease in my supply of these tiles. For me, it must be the knowledge that I could “ruin” lots of black tiles and still have many more left to explore. I think I spoke in previous posts about the generosity of the Zentangle community (especially of Zentangle’s HQ and many of the CZTs (Certified Zentangle Teachers) and regular tanglers from the Zentangle Mosaic app (available in free and full subscription forms from Google’s Play Store for Android devices and from the Apple Store for iOS versions for iPads and iPhones). They sent tiles (mostly white, and in various sizes and shapes), as well as Micron pens, Zentangle and other B3 drawing pencils, sketch pads, colorful Prismacolor Pencils, watercolor pencils, color Microns, color staining tissue, watercolor sets– well, everything and anything anyone has seen me use on the app. One CZT, @JodyGenovese, even sent me river rocks to tangle! It seems the community loved my color-touched tiles as much as (more than?) my black ink on white paper tiles. Alas, I finally had to break down and buy a box of black tiles again, even though I waited until we reached the UK. And I did take advantage of those black tiles again! Unfortunately, there are only so many supplies you can cart around the world, so many donations and personal purchases were shared as I traveled, and before returning to Sint Maarten. It took me months to get back to my island home (St. Martin island) and discover that many of my blank tiles and tangling supplies were in great shape after Irma. As Irma was threatening to bear down on us, I stored as many raw paper and pen supplies as I could in watertight plastic storage containers. I doubted that they could survive a hurricane of Irma’s strength, but the boxes had been expensive enough when I bought them, and I figured my supplies had the best chance of surviving in them. Well, as unpacked or paper box packed items and books turned to pulp around these boxes, and the Irma-given skylight in the ceiling let in all water possible, the items in the boxes survived! Among the supplies were many black tiles and white gel pens and pencils. It took a while longer to set up a quiet place for meditative tangling, but a few days ago I succeeded, and drew my first white on black tile in ages. That’s the one featured. I was afraid I had lost both my passion for tangling and my ability to produce creative tiles, but I learned with this featured tile that maybe I just need more practice–maybe start at the beginning again– to regain my confidence as well as my meditation abilities. Sometimes all I need is a bit of encouragement from the wonderful people on the Zentangle Mosaic app, and a stack of black tiles, to find my niche again. Thank you to all who helped with stuff and with emotional support during a very trying period of my life. I am all set now to go out into the community and volunteer to teach with free supplies to community groups who continue to help those in need, whether children who need to learn to sit still for 15 minutes, or adults dealing with serious health and post-Irma trauma issues. The Mosaic community has provided me with so many supplies to share that I needed extra suitcases and several parcels to bring supplies home with me to share with those in need. I need to buy a few items where Irma shorted me, but I have plenty of supplies to get started here in Sint Maarten (the Dutch side of St. Martin, where my home is). One school has already asked me to teach it’s teachers so they can pass on the anxiety reducing Method to their students. Other organizations are considering. Other groups are putting me in touch with yet more groups. I hope to be really busy soon, and leave the house and contractors to themselves and my Cujo-wannabe dog. Sharing the Zentangle Method. Rings me incredible joy and peace. I want to share that with my ravaged community as we all pitch into the rebuilding effort. Browsing through my album of tiles and my sketchbooks over the weekend was an interesting and surprising experience. I have been tangling since the end of April, 2016–about 10 months. What I saw was growth as well as regression–typical of any learning progress. When my work became more attractive, the same patterns and techniques appeared in a cluster. During times of learning new techniques and patterns, the work became cluttered or less cleanly drawn. The pattern kept repeating in cycles, only now becoming less extreme in its swings. One of my first tangles, late April, 2016. I thought this was so cool! I knew only 9 patterns then, and I included them all! Today’s morning meditation is cheerier, more confident, with a pattern or two learned in the past week. I can confidently draw over 100 patterns now, am familiar with a couple hundred more, and I keep learning a new one or two each day. Only 7 patterns were used. If you look at the tangles above, you can see that, in my early tile, what I lacked in pattern skills I tried to hide behind a bit of flare. Today’s tile is less stilted. Whether it is more pleasant to view is not my call, but I find it more breezy, better developed, and stronger, even though two of the patterns used here are out of my sketchbook and on a tile for the first time. To be honest, I have no inate artistic talent or abilities, and it is only about three years since I learned to produce any art at all. I took up drawing lessons to learn to see things as an artist might, and had limited success. My teacher suggested switching to acrylics (I’m too slow) or oils (which I feared). I even picked up watercolor books and videos and tried to learn that, only to discover that watercolor presents its own unique set of challenges. Then, less than a year ago, I learned about Zentangle. I had been looking for a method of meditation and relaxation that involved movement. Although Tai Chi was an option, I couldn’t find classes here on the island–not then, anyway. Besides, going to a Tai Chi class would have involved getting into the car and searching for parking–not very conducive to relaxation. “Zentangle” was a term I remembered referenced in several of my art how-to books. I thought at first it was some new professional school or method of art. 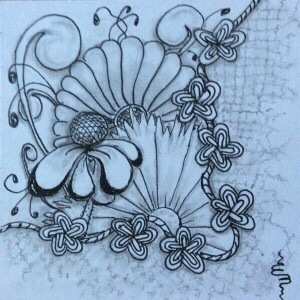 Then I found out it isn’t art in the traditional sense at all–it’s Zentangle, pure and simple. That it centers around drawing is a good thing, I thought to myself. That it can be done by even the most artistically challenged is even better! So I researched more. Although certified Zentangle teachers (CZTs) can be found all over the world–increasingly in China and India–none seem to be in Sint Maarten, the tiny island (well, half-island) country in the Caribbean. So I ordered a book or two from Amazon and set out to see if I could teach myself. I spent well over 20 years teaching children and young men and women professionally. Surely I could teach myself, too. And I did teach myself Zentangle, of a sort. 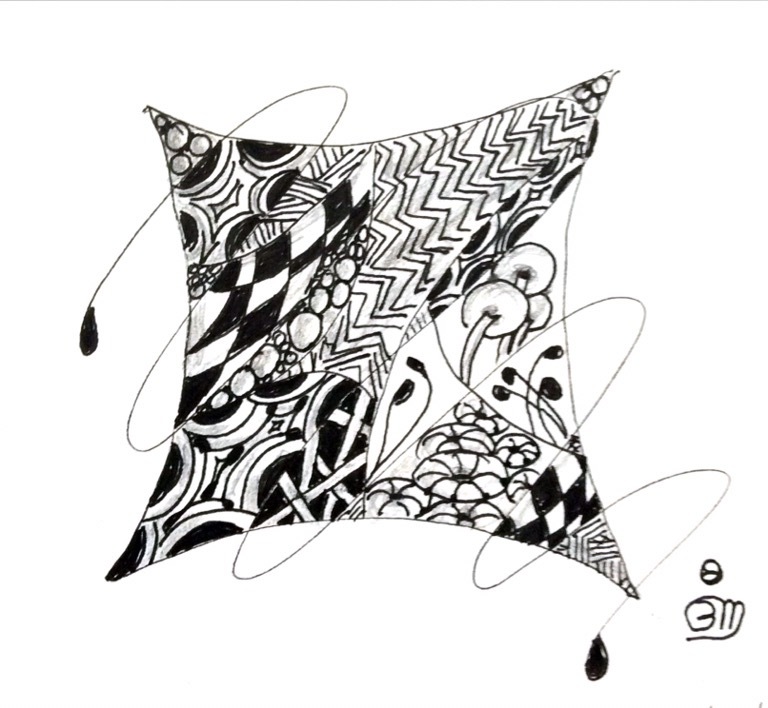 On the official Zentangle site, Zentangle.com, the recommendation is to learn the Zentangle method from a CTZ through a workshop. The second best way to learn is by purchasing the Zentangle Primer, Volume 1, and the Zentangle starter kit, both available for purchase on the web official site. After months of trying with other sources, I broke down and purchased both. Not only did I wish I had done that from the beginning, but I also decided that, because Zentangle was so helpful to me, I wanted to bring Zentangle to this tiny island. In two months, I will be attending a Zentangle seminar to become a CZT so I can do just that. My copy of The Zentangle Primer gets used almost every day. I may never get to all the ideas inside! The book contains step-outs for dozens of patterns that make the complex easy to draw and embellish, as well as dozens of sample “fragments” to develop and “reticula” ideas for grid tangles and strings. 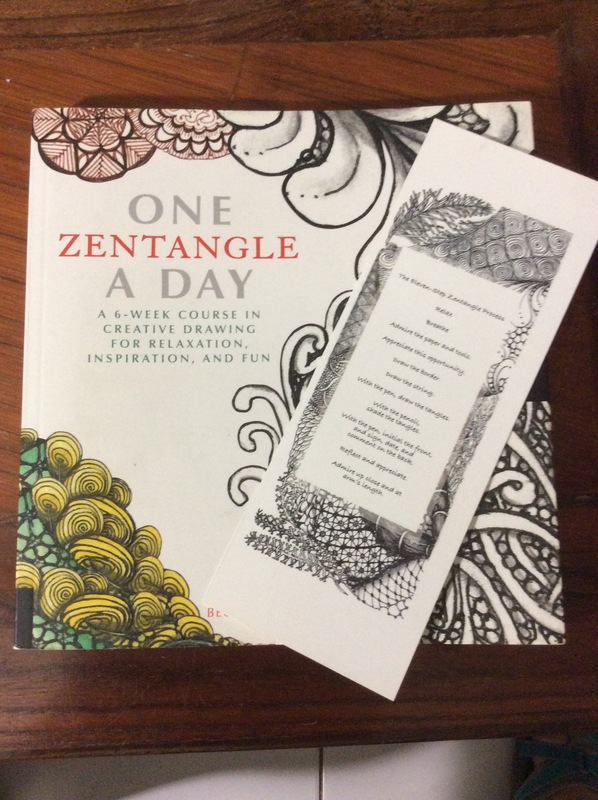 Here’s the thing: I may not have started off with the best self-teaching materials, but I did start off with an excellent resource, One Zentangle a Day, a book by Beckah Krahula, CZT. My well-used copy that contains six weeks of lessons and about 75 patterns with step by step directions. It gave me enough information and techniques to get me started, even if I became frustrated sometimes. As a beginner’s reference, it is a great book, especially if you are looking for at least a little of the mindfulness and relaxation benefits. It contains a lot of information for trying Zentangle on for size, but it doesn’t cover Zentangle principles in depth. A great “first” book at low cost. If all you are looking for is art or crafting ideas, it is also a great source of ideas and buying information. But for a deeper understanding of the Zentangle method and its effects on calming your mind and increasing both focus and creativity–and if you want a book that will continue to be a resource for years to come–then The Zentangle Primer is a must-have book. For me, a helpful resource is an app called Zentangle Mosaic, available in Apple iPad and iPhone format, as well as in Android format. It is an excellent source of inspiration, tips, and friendly and supportive members from all over the world. Many well-known and respected CZTs share their work on the app regularly. Many up-and-coming CZTs participate and provide advice and support. 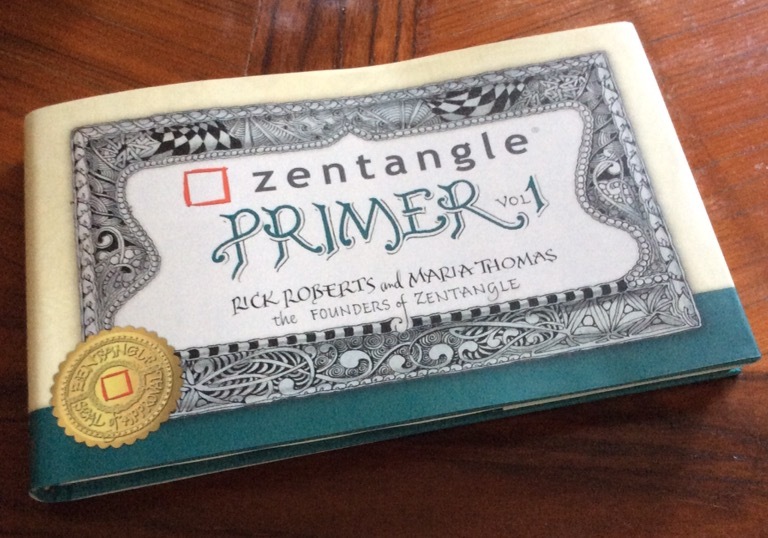 Zentangle founders Rick Roberts and Maria Thomas share their own work, new ideas, and even exclusive videos there. Rick, Maria, and their family interact with members all the time, providing feedback and encouragement, especially to new tanglers. It is a marvelous community of tanglers. Posted work is validated for its “Zentagleness” (my word). There is a free option, if all you want from the app is inspiration, and a paid option, which allows you to upload photos of your work and actively communicate with Mosaic subscribers. I don’t know enough about the free version to compare it to the paid subscription, but I believe that, as lovely as the free version is for viewing others’ work, the most useful features come only with membership. To me, the benefits I derived from the paid subscription is priceless, especially since I tangle alone here on the island. Encouragement from members of Mosaic got me participating in national and international challenges on Facebook and blog sites. The challenges are not as supportive as Mosaic, but I have learned to judge tangles on “Zentangleness” instead of eye candy. Many challenge submissions are Zentangle Inspired Art, which can be beautiful and whimsical, but a lot are by professional artists. They each have something to teach, though, even if the intention is not there. There are many artsy and craft ideas presented by challenge participants. Mindful tangling is difficult to put out there when one is not an artist. My tangling may not compete in artistry, but it solidly represents the Zentangle method and purpose. After one or two posts, I was no longer intimidated by the pros. For an example of a short (two-week) challenge, visit “valentangle2017” on Facebook. It came with a book of instructions for what to include in each day’s tile, along with lovely examples to use as models. The contributor pool was just over 200 participants–small by Facebook standards. Lots of beautiful work on display, though. All of these resources have helped me grow as a tangler. I firmly believe, however, that workshops are the best way to learn Zentangle. When I tangle alone, even with supportive online communities available, it’s difficult to get questions answered or discussions on techniques moving smoothly. There is something about face-to-face contact that helps those of us seeking the mindfulness and meditative aspects of Zentangle. Hopefully, I won’t be tangling “alone” on the island for much longer!